Rumor: iPad 5, iPad Mini 2 Coming In March? Apple released the iPad Mini just a few months ago. 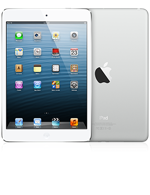 But we have known for some time that it plans to add a Retina display to the next generation iPad Mini. The latest report by Topeka Capital Markets analyst Brian White suggests that Apple could introduce the iPad 5 and iPad Mini 2 in the March of 2013. Our checks at CES indicate Apple will release the iPad 5 and the second-generation iPad mini this March. The iPad 5 is expected to be lighter and thinner than the iPad 4 that was released in October, while the form factor of the iPad mini should be similar to the first generation iPad mini that debuted in October. Other reports have also suggested that Apple will be releasing the next generation iPad early this year. Apple has been updating most of its products on an annual basis. But it may be moving to a shorter update cycle to generate more momentum for its products. It is too early to tell how long Apple will stick with this strategy. At this point, it is not clear how big of an upgrade the iPad 5 will be over the current iPad 4. It will most likely have a better processor and more powerful hardware inside. The device is expected to be a bit thinner. Could it have Sharp’s IGZO display? We can’t confirm that at the moment. Apple iPad 5 Event: iPad Retina … iPad Air $499 … 12 Inch iPad Coming? iPad Mini 2 with Fingerprint Scanner, To Be Delayed?